Police officials who kicked off raids on people with mischievous nature against eve teasing are now planning to conduct awareness sessions basically to the students of various educational institutions on legal implications if they commit such offences. It may be recalled that the District Police formed 10 Mahila Rakshak teams in city limits for preventing any crimes against college going students, employees and women. Modus operandi of the teams is team members keep a vigil at colleges, offices, railway stations, bus complexes, shopping malls, cinema theatres and other places in mufti for identifying the teasers and take them into custody instantly. Majority eve-teasing cases were being reported from Vedayapalem, Haranathapuram, VRC Centre and other areas and the Mahila Rakshak Teams reacted promptly for addressing the difficulties. There are six police stations in the district headquarters and accordingly, six teams have been attached to them. Remaining four teams have been entrusted to the Women Police Station for pressing into action as soon as they receive any calls from the public. Each team consists of four members and they observe developments in the place like normal people. 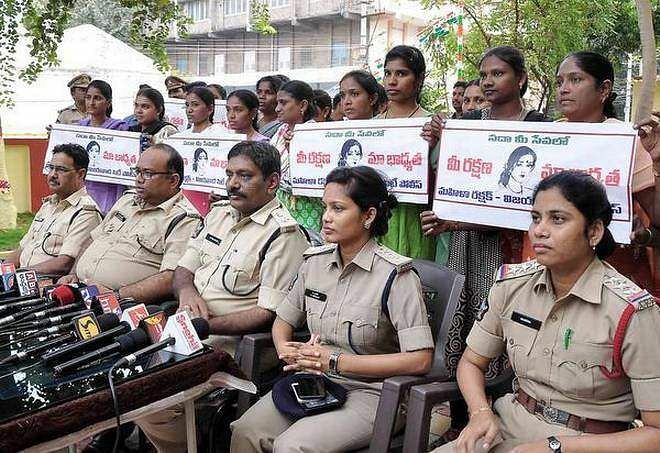 In case they apprehend people who are teasing or harassing women in the areas, they shift them to the police station and conduct initial counselling. They also invite parents for their knowledge in case of students for a prior warning before booking cases. They also provide them with legal implications if a case is booked against them that spoils their career. According to police, around 150 members have so far been taken into custody and counselled them on the repercussions of such offences. They are also inviting parents on the behaviour of their children and giving warnings in the presence of them. They are being released on the personal bail of the parents at least mounting some pressure on the families. Officials say victims have to dial to 100, 9390777727 and 94904 39561 as soon as they identify such situation in the area. They can call, send Whatsapp message or a picture through the mobile phone for immediate action from the teams. "Still, people have to understand the basic idea of setting up these teams. Parents have to educate their kids while sending to schools or colleges providing numbers for facing the situation boldly. Then only there would be usefulness with the teams and continuous vigil on such activities," said a senior official from the police department. Meanwhile, authorities are planning to conduct awareness sessions in educational institutions to curb eve-teasing.